What makes everyone so sure it's Naked Zorro? Hmmmmmm? My money is on the hamburgalar. Maybe it's naked, masked, Mullet-Ted. It's the size of his sword. I think it is the "sword" that makes everyone so sure. I've heard one person call it his tommy-gun, but more popular opinion seems to lean towards calling it a sword. Perhaps the male bloggers can help out with this. Maybe one of the victims has a personal relationship they're not sharing with the authorities? Britt Reid (Green Hornet) was the grandnephew of John Reid (Lone Ranger) so maybe the mask-wearing is genetic. Because Naked Zorro has a trademark move which police have not revealed to the press: He grabs his "sword" and writes a Z in the air. Granted, it's a small Z, but it's a Z nonetheless. haaaa. but i sure thought that boy wonder was cute in 1967. SN: Great minds think alike. So do you and I.
I have a great article just about mullets...if someone can remind me how to post a link (it's been awhile). Maybe he should be looking out for R.O.U.S. 's instead of just the police, eh sophie? 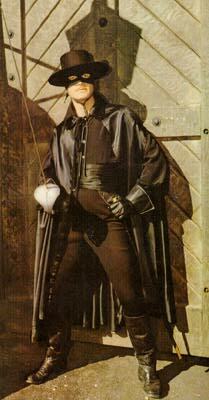 I think Antonio Banderas is much more attractive as Zorro. yummy! Judi, you have really outdone yourself this time. fantastic job!! I mean, given the choice of wielding a skinny fencing sword vs. having super powers, what would you choose? Wow, a new record! A double-post 1 hour and 11 minutes apart. Dont know how that happened. Wow, a new record! A double-post 1 hour and 11 minutes apart. Don't know how that happened. He grabs his "sword" and writes a Z in the air..
Sure it's not in the snow? That's were I practice .... I SO did not say that!